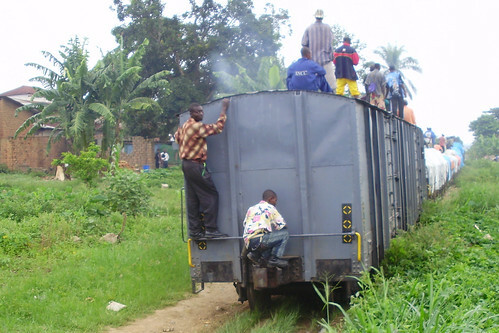 Searching for Bonobo in Congo » Off Track Towards Congo’s Future: the Train. Off Track Towards Congo’s Future: the Train. 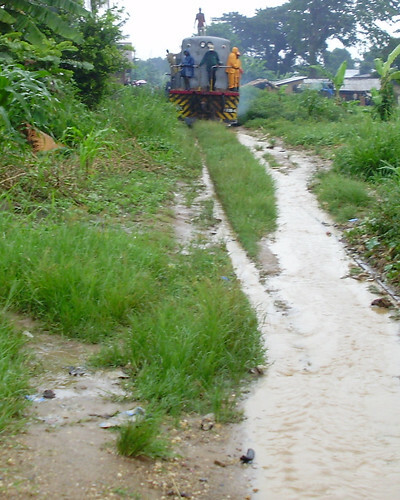 On the map, the Congo River is the perfect commercial conduit for Congo. Shouldn’t it be far superior to America’s Mississippi which, like Germany’s Rhine or France’s Rhone, is basically just a north-south run. The Congo bends through the full range of Congo’s environments as though to accommodate whatever wealth or production each might offer up to the markets of the world. The Congo first flows from the miombo forests of the southeast, through savanna to the south of TL2, along the plateau forest on the east side of TL2, across lowland forest north and west of TL2 and then, bending west, through the crystal mountains and over the sea-side plains. 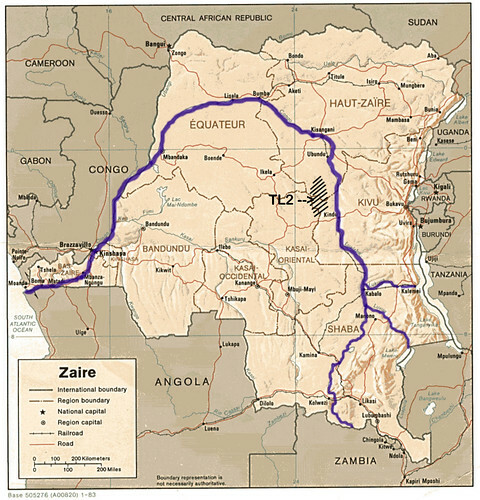 Zaire is now Congo but the Congo River still flows through it from east to west and from south to north. There are just three small problems, all river rapids. The lowest is in the gorges downstream from Kinshasa where the great Congo could – presumably – render enough power to export to all Africa. We hear rumors of a project, a 44,000 MW dam, the Grand Inga, with the ability to provide twice the power of China’s Three Gorges Project. As it is now, only 6% of Congo’s population has access to electricity. The second set of rapids is just upstream from Kisangani and the third is upstream from Kindu—where I am now. 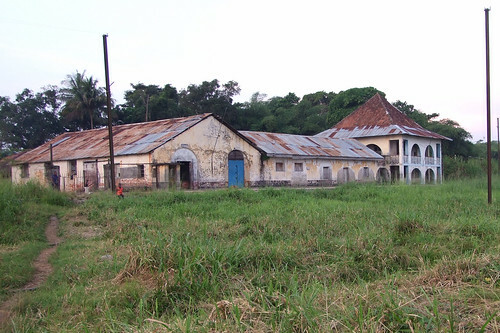 The once-regal Ubundu train station upstream and around the rapids from Kisangani. The empty electric posts mock the force of the river. The Belgian colonialists more than 100 years ago saw the potential of the river as a highway for the riches of the interior. This was how they got the ivory, the gold and the rubber to Europe. Among their first projects: completion of the river-highway with three railroad passes around the three sets of rapids. 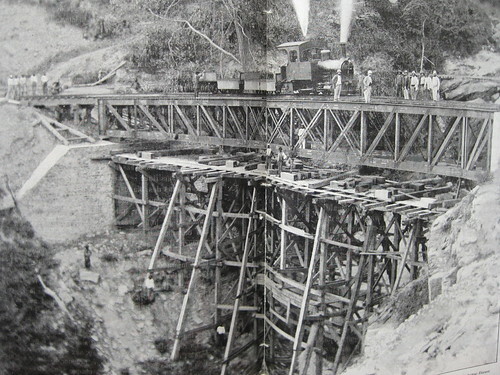 This photograph from the early 1890s shows Belgian railroad construction west of Kinshasa. What is left of this railroad-river highway? The river still flows –no problem. The railroad, it is still chugging along, but at a rhythm and regularity that reflects local interests not a feed into the global economy. In February of this year the train halted coming into Kindu. It was unable to make it through the water pouring over the tracks until an hour after the rain stopped. Baron Empain established the town of Kindu (from where I write this) in the latter 1920s as the final rail link around the upstream rapids. This link completed the conduit, allowing transport from the south-eastern reaches of Congo all the way to the Atlantic Coast. An ancient but determined engine now chugs into Kindu about once a month from Kalemie. 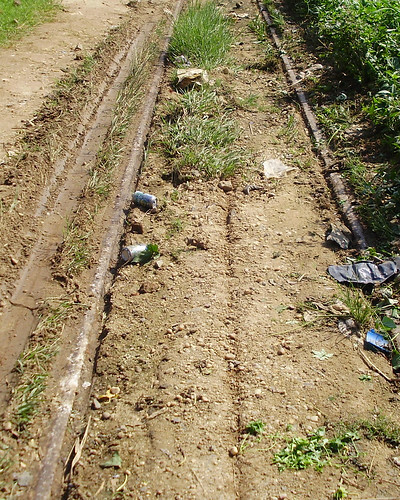 In Kindu, the train managed to pass despite mud build up on the tracks. By the way – the upper Congo is also called the Lualaba, accounting for the second “L” in TL2, the name of our project. If we had taken the three river names: Tshuapa,-Lomami-Congo , we would have been TLC not TL2. We thought about it, but decided that we did not deserve it. Caboose view of the train chugging to the Kindu station. This entry was written by Terese Hart, posted on 2009-03-24 at 3:45 pm, filed under History of TL2, Kindu. Bookmark the permalink. Follow any comments here with the RSS feed for this post. Post a comment or leave a trackback: Trackback URL.